Say hello to my sponsor... For the Love of Joy. A soft color palette and encompassing all things sweet, For the Love of Joy, is full of handmade creations for you or a special little one. Anna, the creator of all the pretty things in the shop, says, "I design and create to bring JOY to women and their family, friends, and home." By the looks of every piece, it will definitely bring a bit of joy! From the mini quilts, family name pillow to child's name custom pillow, everyone single one is equally as sweet and lovely. Her creations are sure to be treasured by everyone! 1. Leave a comment on this post telling me about your favorite item in the shop. If you can't wait to purchase something, Cakies readers will also get 20% off anything in the shop using code MYCAKIES up until Monday April 25th! Not bad, eh?! The giveaway will end at midnight, Monday April 25th PST. The winner will be announced sometime Tuesday morning. Good luck!!! The family name pillow looks like something my Great Gran would have scrapped together & I adore it! I would get the Family Name Pillow in an instant! I adore the child's name pillow, especially the sweet scripture verse. I am expecting a baby boy in July, and this would be perfect for his nursery! Couldn't resist blogging about this giveaway so my followers [aka my sisters] could get in on it! Love the pillows and the be joyful always min quilt! It's so sweet! I love everything but the mini quilts, and the custom pillows are SO cute! I love the child's name pillows!! I like everything in the shop but my favorite would be the name pillows! I love the mini quilt...Love Never Fails! I posted the giveaway on Twitter! I shared the giveaway on my Facebook page! I love the child's name and scripture verse pillow! Such a sweet idea. I love all of her items! 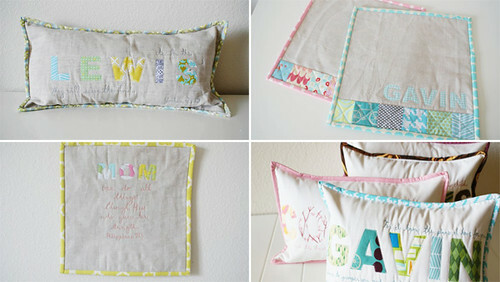 The family name pillows are great and the Be Joyful Always Mini Quilt. I love the Custom Name Pillow with Coordinating Patchwork Pillow!I hope that I could win this giveaway! I love the family name pillow! i love the patchwork coasters! adorable! i too love ths pillows with the scripture verse on it! so personal and meaningful. what a great sponsor you have! I absolutely love the child's name pillow with my favorite verse Jeremiah 29:11. Love the family name pillows! I'm having a hard time deciding between the scripture pillow, and the boppy cover. They're both beautiful. I really love all of her personalized pillows. She has such a great eye for colors! the boppy cover is great! I have to say I'd love a custom quilt! i love the custom name pillows, they are gorgeous. and the embroidered scripture is really beautiful! Oh i love her shop. And she is so sweet, i got to meet her (and see her perfect stitches) in Fort Worth last month! Love, Love, Love the family name pillow. So glad my sister abby posted a link to your blog on hers! Just shared your blog/giveaway on facebook. P.S. your children's book theme baby shower has been the inspiration for my sister's shower! we loved it!!! Both of us are teachers. thanks for sharing on your blog. I love the coasters for your morning or afternoon tea drink ! I love the "love" pillow...so cute to put on the sofa.I also love those mini quilts which would be great for my daughter's dolls. Loving the Family Name pillow! I love the snack mats! Thanks for the giveaway! Beautiful work! I love the joyful mini quilt. I totally want the Family Name Pillow!! It would look great on our bed or in my living room. love the mom mini quilt! LOVE her Family Name Pillow! Thanks for the chance! I love the quilted Boppy cover. What a cute way to dress up a utilitarian item! I love the family name pillow, but also the boppy cover and child's name pillow! So many precious things! Thanks for doing the giveaway! The family name pillow is beautiful! L-O-V-E the custom child's name and verse pillow. adorable shop!! I'm expecting #3 in June and love the quilted boppy cover to refresh things around here...and the mini quilts too. We're expecting our first grandchild in September. We just saw the ultrasound today. It's a boy! I'd love to give him a pillow with his name on it! I love the pillows.. They would look great in my kids room!! The family name pillows are gorgeous....everything is so beautiful..what a fun giveaway!! Love patchwork coasters!!! and family name pillow too!!! i'm just simply in LOVE with the custom name pillows. a must have for all my kiddos. The family name pillows all the way! I would have the JOY JOY JOY JOY down in my heart ....for a name pillow!! I also just HAD to tweet about your Giant Doll House pillows! Inlove!! The quilted bobby cover...i've been eying them for the past few months. Our 3rd is due in September and I'm pretty sure a lovely cover would help make all the time spent nursing feel that much more special.